Blue Planet II has been one of the truly seminal televisual experiences of the new millennium. It is a towering achievement and a shining example of the BBC at it’s very best. This documentary series has opened up hidden worlds that have captured the imaginations of people across the world. Presented by David Attenborough, the BAFTA-Award winning Blue Planet II will now be bringing the wonders and mysteries of the planet’s oceans and wildlife to the UK arena stage. 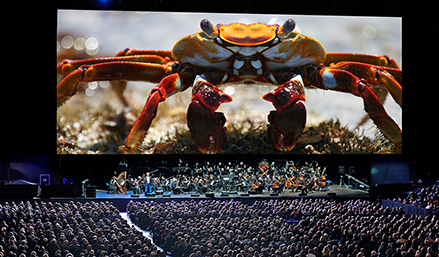 Blue Planet II – Live in Concert will be at Liverpool’s M&S Bank Arena on Tuesday 26th March – presenting a curated selection of stunning visuals from the series projected onto an enormous 200 square metre 4K Ultra HD LED screen. This show will be a fully immersive experience – showcasing all of the incredible oceanic wonders of the natural world. The specialised screen allows for breath-taking detail and will be accompanied by a full symphony orchestra performing music from Hans Zimmer, Jacob Shea, David Fleming as well as the original music score by Bleeding Fingers Music. The creative journey of this documentary series and its cultural impact cannot be understated. As a form of information entertainment, it is one of the best examples in the genre and has broken new ground in terms of the visual experience of the audience. However, it also opens up our eyes and turns our attention to some of the most pressing issues we have as a global society. For example, the impact of human generated waste and its effects on the natural world have been unavoidable topics in the series and have contributed to a surge in support for conservation and environmental causes around the world. The filming of Blue Planet II took over four years, with the teams embarking on 125 expeditions across 39 different countries and filmed on all continents and in every ocean; a truly extraordinary undertaking. It has been noted that the logistical expertise and planning on these projects were the equivalent of those attributed to space travel. For those that have already seen the programme and been witness to the strange and wonderful creatures that the teams unearthed, this comparison will seem quite fitting. The show has been touring the UK and Ireland for just over a week now and the reviews have been truly spectacular. The excitement is already building in Liverpool and this promises to be the biggest and best received show since the renaming of the arena and the creation of the M&S Bank Arena. There are still a few tickets remaining so do not miss the chance to see this incredible show and immerse yourself in an otherworldly experience you won’t forget. Blue Planet II: Live in Concert – 26th March 2019 – Liverpool M&S Bank Arena. Tickets available here.